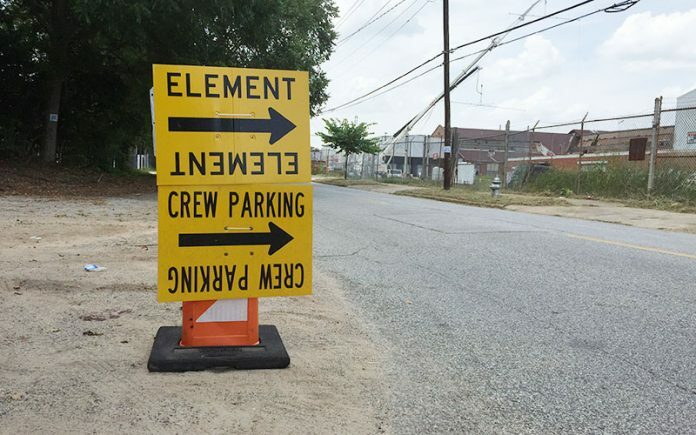 An Allegiant: Part I production sign points cast and crew to Pullman Yard for filming. Summer heat doesn’t slow down the Hollywood of the South. Here’s this month’s definitive collection of what’s filming where and who you’ll see there. Last month, we shared that The Divergent Series: Allegiant Part I (Production code: ELEMENT) would be at Lindale Mill near Rome until June 23. After that, Shailene Woodley, Theo James, Zoë Kravitz, et al moved down to Stockbridge with signs posted along GA-138. More ELEMENT signs were later spotted in Atlanta at Nash Productions on McDonough Boulevard. More recently, crews set up in Kirkwood at Pullman Yard for a July 13 shoot. Next, they’ll be at the High Museum on Monday, July 20. Jamie Foxx’s Sleepless Night (SN) has been busy this month as well. In late June, crews were downtown near Georgia State University. Reader Bryan Thomas sent us a video of what might be a kidnapping scene shot near Underground Atlanta. Additionally, crews were spotted on Chamblee Tucker Road in early July and down by Hartsfield-Jackson Atlanta International Airport on July 10. Last week, they shot on Marietta Street near Fairlie-Poplar. For the rest of July, you’ll be able to find Sleepless Night back by the airport for a big casino scene. Mena (WTM) has also returned to Georgia, bringing Tom Cruise along with it. Filming took a rare trip into the city at the end of June to Cheshire Bridge Road, shooting behind The Colonnade. Signs for this location were plopped on Lavista and Briarcliff Roads. After that, the film moved to downtown Madison, only to return ITP on July 7 for more shooting in Buckhead. Since then, everything’s been back at Ball Ground, Mena’s usual digs. HBO is shooting Confirmation, a film centering on Anita Hill and the controversial Clarence Thomas Supreme Court confirmation hearings of 1991. Scandal‘s Kerry Washington plays Anita Hill, while Wendell Pierce, who you may remember as Bunk from The Wire, portrays Clarence Thomas. Production for Confirmation started July off at Atlanta City Hall and was seen at the Biltmore Hotel in Midtown last week. No coded signs were found in the area, however, leaving many commuters and sign-hunters to ponder what exactly was basecamping on 5th Street. We’re even embarrassed to admit we don’t yet know what the code is for Confirmation. For now, however, the giveaway will be the red and white production signs pointing toward “location” as opposed to the usual “to set” verbiage. Hopefully, we’ll have an update this week when they shoot in Avondale Estates, assuming the city agrees to their requested 1:30 a.m. wrap extension. Ashley Gerasinovich, Natalie Zea, Liam Carroll, and Jason Jones in The Detour. There’s a new scripted comedy coming to TBS written by Daily Show alumni/couple Jason Jones and Samantha Bee. The Detour (DS1) will follow a family (Jason Jones, Natalie Zea, Ashley Gerasimovich, and Liam Carroll) as they road-trip to Florida. Murphy’s law will rule every leg of their trip, as things grow worse with each turn. Think Vacation as a television series. So far, the show worked in Lilburn during the first part of the month, near Ashford Dunwoody and Meadow Lane Road on July 10, and across from the Starlight Drive-In Theatre on Moreland Avenue last week. Look for The Detour to premiere sometime late in 2015. The McDonald’s restaurant origin story, The Founder (Speedee, LLC), has spent most of the last month in Newnan. In addition to shooting at the Coweta County Administration Building, crews were spotted at the old Piedmont Newnan Hospital—the hospital used as the interior of Grady last year on The Walking Dead (SF). Crews did occasionally make it back into Atlanta. On June 22, they shot at Alfredo’s Italian Restaurant on Cheshire Bridge Road and on July 9, near Peachtree Battle Avenue. Aside from Michael Keaton, Nick Offerman officially came to town and delivered this insightful tweet. Another new production this month is Jennifer Garner’s Miracles From Heaven (LANTRAC). Based on the Christy Beam book by the same name, a young girl is miraculously cured of a rare medical disorder after surviving an accident. Filming was spotted at the Gold Dome downtown on July 9 and near Dunwoody High School from July 11 to 14. Signs were spotted as far away as Shallowford Road and Cotillion Drive in the shadow of I-285. Perennial Atlanta film production Captain America: Civil War (GRAPPA) was spotted shooting at Clayton State University on June 25-26. They recreated a New York City street downtown just after the Fourth of July holiday weekend. (Maybe to bring Spider-Man into the mix?) Now they’re back near Pinewood Studios in Peachtree City, with a basecamp at McIntosh High School. We even had a good Robert Downey Jr. sighting when he grabbed some hard-earned food from the Blaxican Food Truck. Also around town this month, Finding Carter (WHO) has resumed production, shooting in Douglasville. Although it hasn’t stated its production schedule yet, Sleepy Hollow will film on Forsyth Street on July 24. When the show previously filmed in North Carolina, the code was SH, but that could change when signs start going up around Wednesday. Home Free (HF) was near Mountain View Elementary in east Cobb County on July 7, as well as in Buford on July 12. USA’s Satisfaction (SAT) ended June on Loop Road, near the airport, and was also spotted at Oglethorpe University on July 12. The independently financed Offer and Compromise (OC) has been spotted in Norcross. Devious Maids (DM) signs peppered Moores Mill Road and I-75 as well as in Stone Mountain. Keeping Up with the Joneses (Scorpion) was at West Peachtree and 15th Street on June 23. Fans of The Vampire Diaries (LOC) and The Originals (TOGS) might want to start looking around Covington and Conyers—both shows have recently begun filming for the year. And lastly this month, a bit of an odd one: Seth Rogen was in town last week shooting a few scenes for his holiday-themed comedy, X-Mas (X). Principal photography for X-Mas was shot in New York City . . . in late 2014. So not only are these reshoots, but they are reshoots for a film that didn’t even shoot here originally. Regardless of if our tax credits are that good, filming took place downtown near Cone Street on July 11, and near Lithia Springs and Douglasville on July 12 and 13. We might not be sure why they chose to reshoot in Georgia, but hey, as long movies and TV shows want to come here, we’ll keep sharing ’em with you. Want to be on a home improvement reality show? Read this first.